In 1998 I was invited on an Expedition with a group of folks like myself in marketing who provided pro-bono advertising to the wonderful non-profit Outward Bound. We trekked through the Annapurna foothills of Nepal. Our guides were Sherpas. Before then I had no idea who or what a Sherpa was. Well, that experience opened me up to the unique Sherpa culture and spirit. And it provided a fresh perspective that I have incorporated into my life and business. I saw qualities in the Sherpas that were invigorating and inspiring. I appreciated deeply how the Sherpas lead with a “quiet confidence” that I had never experienced before. They were the leaders, but I was on my own path. And I trusted the Sherpas completely. I also made a friend, Karma Sherpa. Upon returning from Nepal, as a way of holding onto that spirit, I immediately changed my title at DoubleClick, where I was the first head of marketing, to “Marketing Sherpa.” In 2002, I founded Sherpa Marketing, which I run today (http://www.sherpamarketing.net). But, over the years, this has become more than a marketing handle for me. For ten years after the trip, I lost touch with Karma. But, in my desire for self-awareness and improvement as a business leader and person, I never lost touch with the spirit I found in Sherpas. And, I made note when collaborating with someone in the Western world who I believe has a special, Sherpa-like quality. Commitment to team. Sense of purpose. Positive energy. Calm during tense situations. Acceptance of mistakes. Perseverance. Selflessness. Compassion. Trustworthiness. And lazer-like focus on achieving a goal. The principles by which Sherpas live and lead have become like guideposts for me. In early 2009, I was encouraged to record these observations for a eventual book so that others may benefit from these “Sherpa principles.” A week after I started working on The Sherpa Path, I was on a business trip. I was excited as I began the writing process during the flight. Upon landing in St. Louis, like everyone else seated around me, I rushed to retrieve voice messages. The voicemail left on my phone shocked me – a call out of the blue from Karma. A few months later I went to visit Karma at his new home in Boulder Colorado and we have been in constant touch ever since. This blog, The Sherpa Path, shares a series of audio interviews conducted with Sherpas and Westerners, whom I have come to know and I believe have a Sherpa-like quality. It also provides a “journal” from the expedition that Karma and I went on together to Mt. Everest Base Camp in March-April 2012. 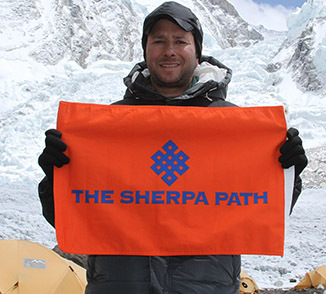 I hope that you can find some insights and inspiration to help you reach your goal or what I call, “Summit of Success.” And, I would appreciate your contribution through comments and by sharing The Sherpa Path with others seeking to find their way. I’ve enjoyed my 20+ year career Path, including: launching Snapple at ad agency Kirshenbaum & Bond; defining DoubleClick as first head of Marketing; building innovative marketing agency Digital Pulp as CEO; Working on NY/NJ Super Bowl bid; running marketing as CMO of RIDEMAKERZ and eMusic; founding Sherpa Marketing in 2002 – a consulting firm with clients such as BMW, CNN, Gilt and Yahoo! ; and currently marketing MINI, a division of BMW. Along the Path, I’ve made note of unique experiences and people. The most dramatic shift in my perspective came years ago in the Himalayas where I met Sherpas, guides who overcome incredible obstacles to reach the world’s highest Summit. I found their approach motivating and empowering. I recently went on an expedition to Mt. Everest Base Camp to learn more about Sherpas and inevitably about myself. The Sherpa Path shares what I am learning, which I hope will inspire others to reach their “Summit of Success.” I invite you to follow the Path and share your thoughts.